Parslinux was a Slackware and Slax-based distribution and live DVD with partial support for Persian (Farsi), as well as the default English language. 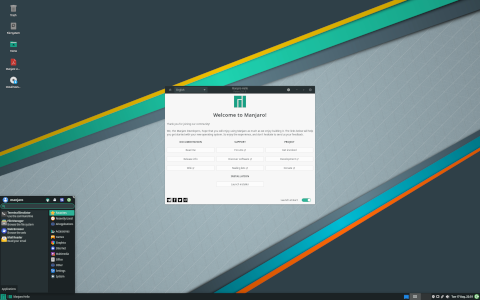 Rate this project Philip Müller has announced a new release of Manjaro Linux, an Arch-based distribution designed to be easy to install and use. The new release features a date-based version number, 15.09, along with a new graphical system installer, called Calamares. Manjaro Linux 15.09 also includes Firefox 41 and updated kernel packages. "I'm happy to announce Manjaro 15.09 (Bellatrix)! Since June we are working on this release. First thing you will notice, this release was not tagged 0.9.0 as we would have normal done. Well, we had a discussion with all developers and decided to go for date tags from now on. Also new is: we ship with Calamares as an alternative graphical installer. It is now stable enough to be used on productive systems. You can still use Thus. Also our terminal installer got some small improvements." Manjaro Linux 15.09 is available in three official favour's (Xfce, KDE and Net) along with several community spins. More details are available in the project's release announcement. Download (pkglist): manjaro-xfce-15.09-x86_64.iso (1,495MB, SHA256), manjaro-kde-15.09-x86_64.iso (1,878MB, SHA256), manjaro-net-15.09-x86_64.iso (543MB, SHA256). Manjaro Linux is a rolling release distribution based on Arch Linux. The project has published a new stable release, Manjaro Linux 18.0. The new release runs version 4.19 of the Linux kernel, which is a long term support kernel. There have been a number of fixes to the Pamac package manager and updates to the Manjaro Settings Manager. "Kernel 4.19 LTS is used for this release, such as the latest drivers available to date. Relative to the last installation media release, our tools have been improved and polished. The Manjaro Settings Manager (MSM) now provides an easy-to-use graphical interface for installing and removing the many series of kernels we offer. Manjaro's selection of readily available kernels remains the most extensive of all Linux distribution we know of. At the time of this release, eight kernel-series are available directly from our binary repositories, ranging from the mature & rock-solid 3.16 series to the latest 4.19 release. Additionally we offer three realtime kernel series. Such a wide array of available kernel options results in extensive hardware support, getting the most out of your system for you, be it old or new." Further information can be found in a release announcement on the project's forum. Download (pkglist): manjaro-xfce-18.0-stable-x86_64.iso (1,905MB, SHA256, signature, torrent), manjaro-kde-18.0-stable-x86_64.iso (2,021MB, SHA256, signature, torrent), manjaro-gnome-18.0-stable-x86_64.iso (1,886MB, SHA256, signature, torrent). Philip Müller has announced a new update to the rolling Manjaro Linux distribution. The new installation media, labeled Manjaro Linux 17.1.0, ships with several package upgrades. "This is our second try with Xorg-Server v1.19.6. This time we also updated our Mesa-Stack and changed the handling of DRI/DRM. Some reported Compiz not working with this. Therefore we had it updated to the latest source currently available. Friends of GIMP may try out the latest development edition of this fantastic graphical art app. Again we have the latest Firefox and WINE added. Also linux49 and linux414 got updated to their latest point-releases. This marks the last update of Manjaro in 2017. We wish you all the best for next year. Have fun and celebrate with family and friends!" The release announcement mentions Manjaro Linux will no longer officially support 32-bit packages, but 32-bit support can be found through the related Manjaro32 project. Download (pkglist): manjaro-xfce-17.1.0-stable-x86_64.iso (1,702MB, SHA1, signature, torrent), manjaro-kde-17.1.0-stable-x86_64.iso (2,043MB, SHA1, signature, torrent), manjaro-gnome-17.1.0-stable-x86_64.iso (1,754MB, SHA1, signature, torrent). Philip Müller has announced the release of an update to the Manjaro Linux distribution, a desktop-focused derivative of Arch Linux. This update, Manjaro Linux 17.0.3, brings a number of bug fixes and newer packages. It is also likely to be the last version of Manjaro Linux to support 32-bit computers. "Manjaro Gellivara was a great release! Now we are proud to announce v17.0.3, our final release of Gellivara. It took us a little over two months to finish this updated version. We improved our hardware detection, fixed some features in our installer (Calamares), added the latest packages available to our install media and polished our release as a whole. Everyone, who used older install media than v17.0.2 release, should read also this announcement about password weakness and follow its advice to secure your systems. Also, Gellivara is the last edition of Manjaro Linux supporting 32-bit Architecture. Read more about this decision here." The release announcement has more details. Download (pkglist): manjaro-xfce-17.0.3-stable-x86_64.iso (1,615MB, SHA1, signature), manjaro-kde-17.0.3-stable-x86_64.iso (1,965MB, SHA1, signature), manjaro-gnome-17.0.3-stable-x86_64.iso (1,652MB, SHA1, signature). Philip Müller has announced the release of Manjaro Linux 17.0.2, an updated build of the project's "Gellivara" set of distributions featuring KDE Plasma 5.10, GNOME 3.24 and Xfce 4.12: "Manjaro Gellivara was a great release. Now we are proud to announce 17.0.2 which fixes a lot of issues we had with our original release of Gellivara. It took us almost three months to finish this updated version. We improved our hardware detection, renewed our installer (Calamares), added the latest packages available to our install media and polished our release as a whole. Everyone who used older install media than this release should also read this announcement about password weakness and follow its advice to secure your systems. Features of this updated release Gellivara: latest LTS kernel from the Linux 4.9 series; latest X.Org stack from the 1.19 series; latest KDE Plasma 5, Applications, Framework and Qt; updates to our graphical package managers; enhancements and improvements to our Manjaro Tools and Profiles...." Here is the brief release announcement with a screenshot. Download (pkglist): manjaro-kde-17.0.2-stable-x86_64.iso (1,922MB, SHA1, signature), manjaro-gnome-17.0.2-stable-x86_64.iso (1,359MB, SHA1, signature), manjaro-xfce-17.0.2-stable-x86_64.iso (1,557MB, SHA1, signature). Philip Müller has announced the release of Manjaro Linux 17.0, the latest stable version of the Arch-inspired desktop distribution with a choice of KDE and Xfce desktops (as well as several "community" flavours). This release updates the KDE Plasma desktop to version 5.9.3: "Our KDE edition continues to deliver this powerful, mature and feature-rich desktop environment with a unique look-and-feel, and with the perks of Manjaro's latest tools. We now ship Plasma 5.9 desktop in combination with the latest KDE Applications 16.12. It was a huge step to get it all playing together smoothly and to give the user experience the same feeling as our KDE 4 editions of the past. The Manjaro Settings Manager (MSM) now provides an easy-to-use graphical interface for installing and removing the many series of kernels we offer. Manjaro's selection of readily available kernels remains the most extensive of all Linux distribution we know of." Here is the release announcement for the KDE edition and there is a separate one for Manjaro's Xfce variant. Download (pkglist): manjaro-kde-17.0-stable-x86_64.iso (2,038MB, SHA1, signature), manjaro-xfce-17.0-stable-x86_64.iso (1,463MB, SHA1, signature). Philip Müller has announced the release of a new snapshot of the Manjaro Linux distribution. Manjaro is a rolling release distribution which strives to be user friendly and provides a wide range of desktop spins. The new release, Manjaro Linux 16.10, offers mostly package upgrades, including systemd 231 and the Plasma 5.8 desktop environment. "We have now Plasma 5.8.2, Firefox 49.0, Nvidia 370.28, LibreOffice 5.1.6, Systemd 231, Octopi 0.8.5 and Pamac 4.1.5 added to these install medias. Calamares 2.4.3 has following highlights: fixed user creation so it obeys the list of default groups for new users; added Deepin support to the display manager module; fixed an issue which could cause a failed install with LUKS if other LUKS partitions are already present; improved system requirements configuration checking; fixed case-insensitive path handling when installing GRUB on VFAT file systems...." Additional information and screenshots of Manjaro Linux 16.10 can be found in the project's release announcement. Download (pkglist): manjaro-xfce-16.10-stable-x86_64.iso (1,504MB, SHA1, signature, torrent), manjaro-kde-16.10-stable-x86_64.iso (2,112MB, SHA1, signature, torrent). Philip Muller has announced the release of Manjaro Linux 16.08, a desktop-oriented distribution originally forked from Arch Linux. This version comes in two editions, shipping the Xfce 4.12 and KDE Plasma 5.7 desktops: "After two months of development, we are happy to present Manjaro 'Ellada' to you! The Xfce edition remains our flagship offering and has received the attention it deserves. 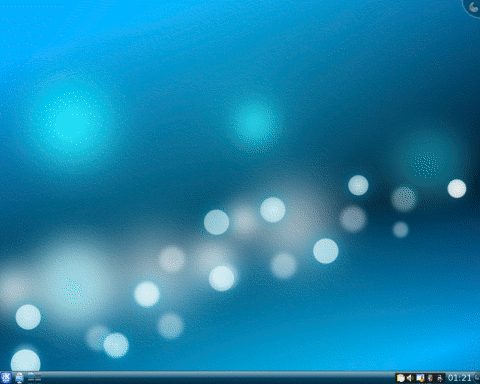 Few can claim to offer such a polished, integrated and leading-edge Xfce experience. We ship Xfce 4.12 with this release of Manjaro. We mainly focused on polishing the user experience on the desktop and window manager, and on updating some components to take advantage of newly available technologies such as switching to a new Vertex-Maia theme. Our KDE edition continues to deliver this powerful, mature and feature-rich desktop environment with a unique look and feel, and with the perks of Manjaro's latest tools." Continue to the release announcement for further information, changelog and screenshot. Download (pkglist): manjaro-xfce-16.08-x86_64.iso (1,489MB, SHA256, signature), manjaro-kde-16.08-x86_64.iso (1,948MB, SHA256, signature), manjaro-net-16.08-x86_64.iso (668MB, SHA256, signature). Philip Muller has announced a new release of Manjaro Linux, an Arch-inspired rolling-release distribution. The new version, Manjaro Linux 16.06, features Linux kernel 4.4 (along with ten alternative kernel versions) and many improvements to the graphical software manager. "Some features to point out in this release: kernel 4.4 LTS is used for this release, such as the latest drivers available to date. Relative to the last installation media release, our tools have been improved and polished. The Manjaro Settings Manager (MSM) now provides an easy-to-use graphical interface for installing and removing the many series of kernels we offer. Manjaro's selection of available kernels remains the most extensive of all Linux distribution we know of. At the time of this 16.06 release, eleven kernel-series are available directly from our binary repositories, ranging from the mature and rock-solid 3.10 series to the latest 4.6 release." Additional details can be found in the project's release announcement. Download (pkglist): manjaro-xfce-16.06-x86_64.iso (1,531MB, SHA256, torrent, signature), manjaro-kde-16.06-x86_64.iso (1,932MB, SHA256, torrent, signature), manjaro-net-16.06-x86_64.iso (655MB, SHA256, torrent, signature). The Manjaro Linux project has announced the availability of a new development snapshot for the distribution's upcoming 16.06 release. The snapshot, Manjaro Linux 16.06 Preview 2, ships with Xfce 4.12, KDE's Plasma 5.6, version 4.4 of the Linux kernel, a graphical configuration module for managing kernels and the Pamac package manager front-end is more flexible when it comes to software updates. "We ship Xfce 4.12 with this release of Manjaro. We mainly focused on polishing the user experience on the desktop and window manager, and on updating some components to take advantage of newly available technologies such as switching to a new theme called Maia, we already using for our KDE edition. Our KDE edition continues to deliver this powerful, mature and feature-rich desktop environment with a unique look-and-feel, and with the perks of Manjaro's latest tools. We ship now Plasma 5.6 desktop in combination with the latest KDE-Apps 15.12." Additional information can be found in the release announcement. Download (SHA1) (pkglist): manjaro-xfce-16.06-pre2-x86_64.iso (1,441MB, SHA256, signature), manjaro-kde-16.06-pre2-x86_64.iso (1,866MB, SHA256, signature).